We are making significant advances in the way we power our homes, vehicles, and infrastructure. Batteries and fuel cells are two areas of particular strength for our faculty. 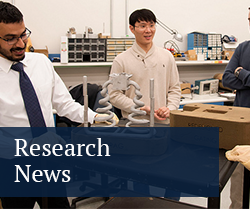 Through the Battery and Energy Storage Technology (BEST) Center faculty and students work with advanced materials used to manufacture batteries as well as energy storage systems. Our faculty and students also have strong research in power generation and propulsion. These labs range from large-scale combustion and turbomachinery facilities to computational facilities for wind energy research or atomistic and system level simulations.